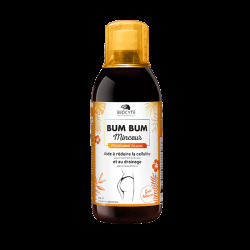 The Bum Bum range, is a set of products that helps you to reduce cellulite on your buttock thanks to grape marc extract, guarana and LipOutTM. This Bum Bum pack contains 3 products: Bum Bum slimming (a drainer), Bum Bum fat burner and Bum Bum cream. Thanks to these products, your buttocks will be firmer, smoother-looking and your whole silhouette reshaped. What can we find in this anti-cellulite pack ? The bum bum pack regroups the three products of the range. A cream, a fat burner and a drainer. When purchasing a pack, you will get a free drainer (hibiscus taste) and save €19! Why choose these products ? - The Bum Bum burner : based on maté, Brazilian guarana, green coffee and pineapple. Brazilian guarana contains caffeine that boosts the whole body and helps to destock fats and eliminate fat cells. The Bum Bum burner helps to fight against excess weight and facilitates slimming as part of a slimming programme thanks to guarana and maté. 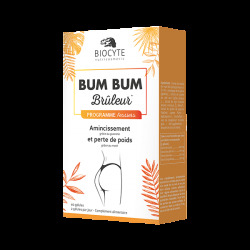 - The Bum Bum draineur : the objective of a weight loss cleanse is to erase water in excess on tissues in thighs, arms or buttock… The Bum Bum Minceur has a pleasant hibiscus taste and helps to cleanse the body thanks to the maté and the grape marc extract. * Effectiveness proven by clinical study under dermatological control, conducted on LipOutTM. The study relied on 61 male and female volunteers, between 18 and 60 years of age (with a BMI **> 23 for women and> 25 for men). The cream was applied twice a day for 56 days. Shake before use. Dilute 25 ml per day in a large glass containing 200 ml of water. To be taken cold, preferably in the morning. Once opened: keep in the fridge and use within 30 days. HYDROXIDE, MALTODEXTRIN, HYDROLYZED ELASTIN, ALPHA-ISOMETHYL IONONE, CAPSICUM ANNUUM FRUIT EXTRACT.